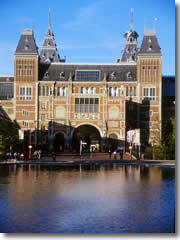 The Rijksmuseum in AmsterdamThough it doesn't get as much press as the Louvre or the Uffizi, Amsterdam's Rijksmuseum is one of the top museums in Europe. 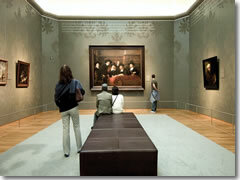 Naturally, it has the largest collection of Dutch masters in the world. Rembrandt is the star of the show, weighing in with a couple of self-portraits, the gruesome Anatomy Lesson, the racy The Jewish Bride, and his masterpiece, The Night Watch, which is the defining work of Dutch painting's Golden Age. Frans Hals is well-represented, with The Merry Drinker being one of his best portraits. There are party scenes courtesy of Jan Steen, de Hooch's intimate interiors, still-lifes by Bollengier, and four Vermeer paintings, including the famed Woman Reading a Letter and The Kitchen Maid. 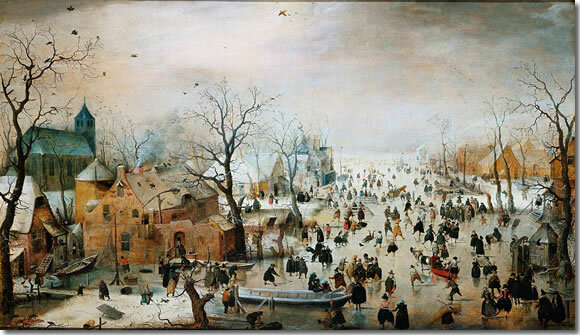 One of my faves from among the less-famous pieces is Hendrick Avercamp's Winter Landscape with Ice Skaters, a 1608 scene that sums up the Netherlands I had always pictured from storybooks growing up. Planning your time: You could easily spend all day here, and many art-lovers do, but if need be you could give the Rijksmuseum just two hours or so—but try to budget three to four hours, if you can swing the time. The museum tends to empty out after 4pm, so during the crowded summer season you can have more elbow room if you arrive mid-afternoon—but don't come too late; the ticket office closes at 5:30pm. Leave big bags at your hotel: You cannot enter the museum with any bag larger than 55 x 35 x 25 cm (22" x 14" x 10")—though that's pretty huge, about the maximum size of an airline carry-on. Tram: 2, 5, 6, 7, 10, 12. Bus: 26, 65, 66, 170. Canal Bus: Red, Green, or Orange (to Rijksmuseum/Van Gogh Museum).